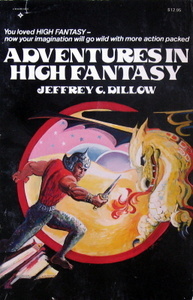 The original 1978 edition was staplebound with a color cover sleeve. 44 pages. 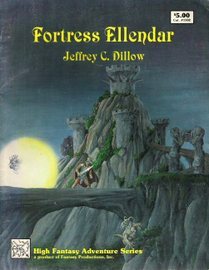 "Fortress Ellendar is an exciting fantasy adventure designed for 2 to 10 players. 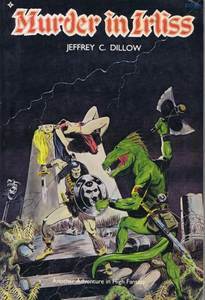 It has sixteen pages written in an interesting story form complete with new monsters and magical weapons. 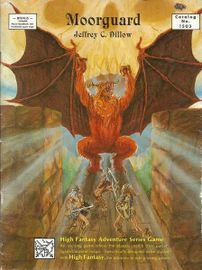 The unique role playing basis of this game allows family and friends to work together in solving riddles, casting spells, and destroying fearsome creatures. The enclosed 11" x 17" map, along with other maps and reference materials, makes this game as equally enjoyable for the judge as it does for other players. Everyone will love scheming against seemingly impossible odds in this challenging mystical world." Driven into unknown dangers the players must search for a legendary axe and shield that hold the key to their freedom. On sacred grounds and against deadly enemies they will have to use their greatest magic to win both safety and sweet reward. Moorguard is an exciting High Fantasy Adventure game created to take the work out of fantasy role playing. It contains 24 pages of new creatures, magic items and weapons, complete with a Players Handbook designed on parchment paper. This role playing game will provide hours of enjoyment as the players work together to solve the riddles of this enchanting mystical world." "Welcome to the exciting world of high adventure, role-playing games. 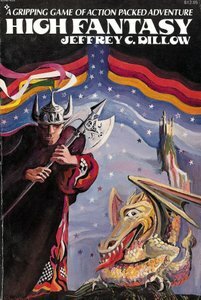 Let your imagination run wild through an adult world of bloodthirsty monsters, sworded knights, powerful wizards, and wondrous magic. 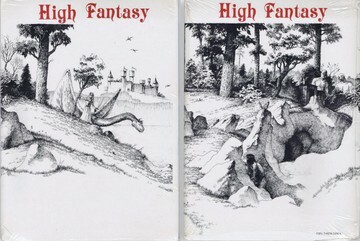 HIGH FANTASY provides your solo adventure, your introduction to the entire series of these imaginative fantasy games. 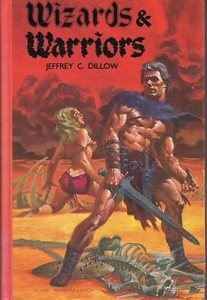 You'll get all the basic rules and descriptions of monsters, and you'll see how to construct a fantasy character. This ultimate adventure game will provide you with countless hours of gripping action." "Actually four games in one, ADVENTURES IN HIGH FANTASY begins where HIGH FANTASY left off. You'll get three wondrous adventures for warriors and wizards to travel through: Fortress Ellendar, a breathtaking adventure to match wits against an evil demon prince; Moorguard, a powerful wizard tries to create the ultimate weapon when the players stumble across his taboo-riddled lands, Terra Ash, a temple buried for hundreds of years with three warring societies that believe the world has perished. The fourth game, Lords of Conquest, is a miniatures fantasy wargame that shows you how to handle large-scale confrontation between fantasy armies. Four great ways to exercise your imagination!" 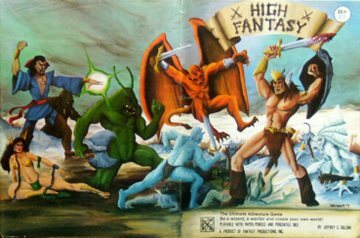 "Welcome to the world of high adventure, role-playing games! If you loved Adventures in High Fantasy, you are sure to enjoy Goldchester. 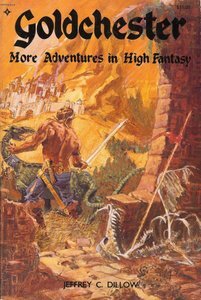 This book contains five large adventures, for games enthusiasts of all ages! All you need is a group of players, the book, and your imagination —now you are ready for countless hours of gripping action! Goldchester is an ancient medieval city full of magic and mystery. Since its founding, the town has been conquered by an enemy —leaving a third of it razed and the remainder subject to enemy rule. As the game begins, you may explore the magical shops, its armories, its raucous taverns, and winding streets. Castle Knot — A Dark Lord from this castle threatens to defect from the enemy army. But could this be a trick? The players are sent on a deadly mission to find the truth. Quest for the Heart of Set Te Mu - The players travel to the ancient grave sites of seven disciples of Set Te Mu, the ancient god. The players must discover the hidden secret of its heart and release its spirit. The Dehyscik Canyon — An ambushed caravan brings the players into an area full of enemy troops and within the grasp of 'undead' warriors." "Someone has killed the prince! As the prince's bodyguard, you are told by the King that you must find the murderer — or die yourself. At any time in your search you can be killed — it all depends on .your resourcefulness, your skill, and your ability to outwit your pursuers! Discover the fun of playing a high fantasy game — it's easy and you can do it alone. Murder in Irliss is a solo adventure — the reader is given the plot, the adventure, and a series of scene selections. You will travel through a fantasy kingdom attempting to solve the murder. The key is the discovery of the "Fate Stones," and your ability to remember the clues along the way. Could it be the King who murdered the Prince? Or Lady Ella, his fiancé? Maybe it was even you — your mind was taken over by an evil wizard! Or perhaps the Prince isn't really dead — the mystery of Murder in Irliss is waiting for you to solve! Not for kids only. Murder in Irliss is popular with games enthusiasts of all ages. With over 600 scenes. Murder in Irliss is one of the most complex, creative, and challenging high fantasy games ever created!"